Explore geometry and topology with hands-on examples like prisms, antiprisms, Platonic solids, and Möbius strips. Build logic skills by playing and strategizing through tangrams, toothpick puzzles, and the game of Nim. Draw graphs to learn the language of connections. Discover how to color maps like a mathematician by using the fewest colors possible. Create mind bending fractals with straight lines and repeat shapes. And don't worry about running to the store for expensive supplies! Everything needed to complete the activities can be found in the book or around the house. Math is more important in schools than ever. Give your children a great experience and solid foundation. 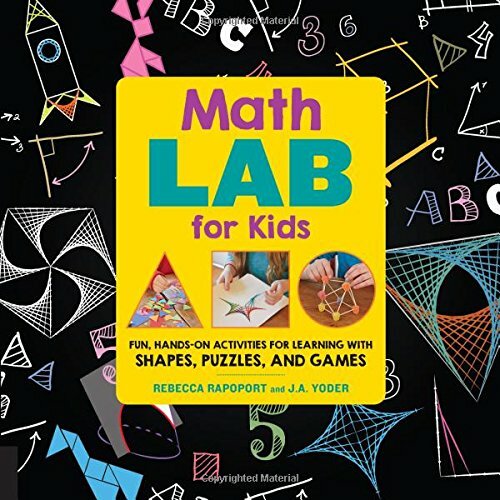 The authors have written a math activity book which will keep your children actively engaged in thinking,learning, and having fun for hours. The range of subject matter includes: geometry, topology, maps, curves, fractals, tangrams, puzzles, games, and graphing. They included the solutions to the puzzles, tangram shapes to cut out and use, and hints to help with solving or leaning . Each chapter begins with a "Think About" question. Many chapters have "Try This" sections and there are even some sections which would be perfect for a math grouping of children. The book was easy to use and understand. The introductions to each chapter were clear and concise.The authors included math facts and either diagrams or photographs to assist with the concepts.Most of the equipment/tools needed are ones you might have around your house or are easy to find. I think your child will enjoy the activities and feel both successes and challenges working through each chapter.